Nameless Finish and a Giveaway! I have another finish to show! 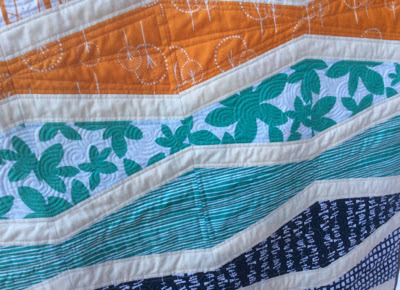 For more information on the quilt design and the reason why I made it, you can read all about it here. I quilted straight lines echoing the colourful zig-zags about 1/4" apart, using my walking foot. I then used my Hera marker to trace lines radiating from the "valleys". I love the look it gives the quilt. For the binding, I decided to use the same white as the background. 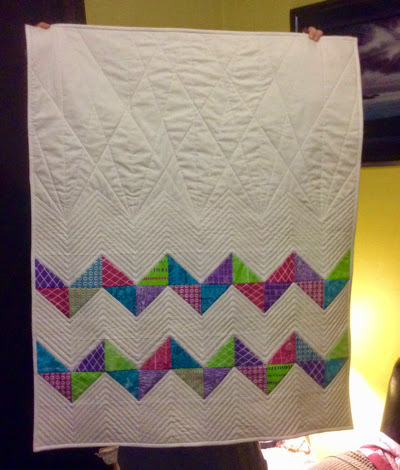 I really wanted the focus to remain on those zig-zags and on the quilting. 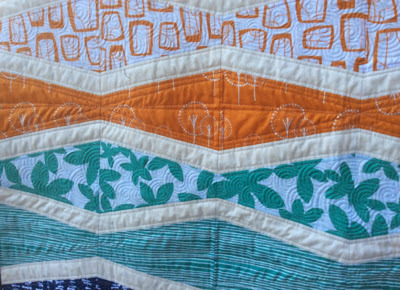 I haven't yet prepared the label for this quilt because I am completely and totally unable to come up with a name for it. To be fair, I will show the suggestions to members of a jury composed of my family, and they will choose. :-). This giveaway is open to everyone and I will announce the winner on Wednesday, February 4. 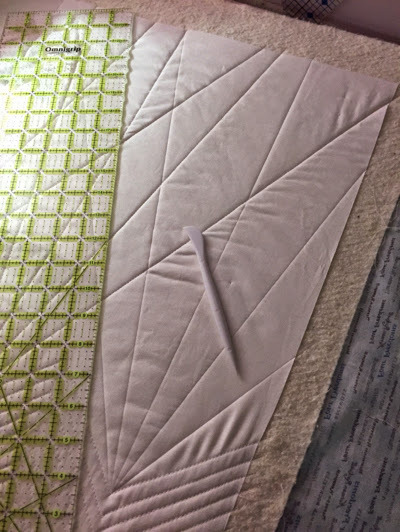 Will be linking up at Crazy Mom Quilts and TGIFF hosted by The Devoted Quilter. And this is the 2nd finish on my 2015 Q1 FAL list! 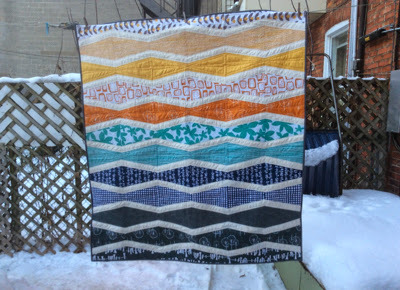 I'm very happy to share my first finish of 2015! I finished sewing the binding on last night and braved the super cold temperature outside to snap some pictures when I got home today. 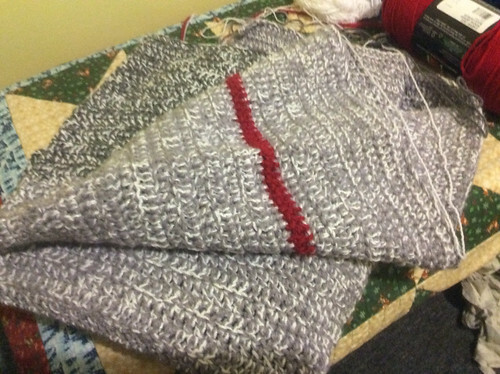 The pattern is by Elizabeth Hartman. 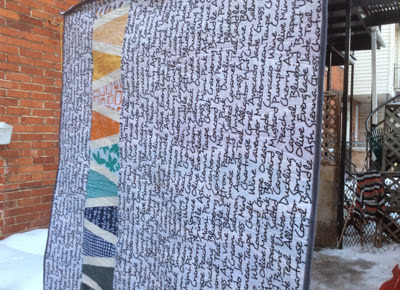 This is a lap quilt and it finishes at 50" x 55". I used fabrics from an older Lotta Jansdotter collection - Glimma. 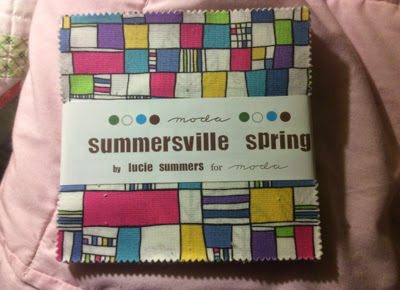 The colours are just gorgeous and the pattern is perfect for showing off those beautiful prints. For the binding, I wanted something simple so chose a Kona grey (not sure the exact shade though). On the back, I used a Windham word print and a column of leftover blocks. I absolutely love the back! This little quilt is now ready for a wash and dry. Once it's nice and crinkly from the dryer, I will deliver it to my friend Liane. Hopefully, New Wave will keep her warm and wrapped up in love while she fights this damn cancer. Will be linking at Crazy Mom Quilts for Finish It Up Friday and at TGIFF hosted by Michelle at From Bolt to Beauty this week. And this is the first finish on my 2015 Q1 FAL list! Yay! Ever since I set up an additional sewing station in the city, I have been unable to sew on the weekend. 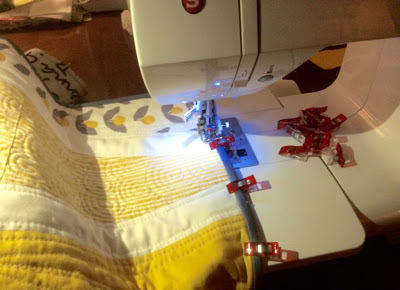 When we were packing up to leave for the weekend on Friday last week, I decided I really wanted to finish quilting New Wave so I brought my sewing machine. 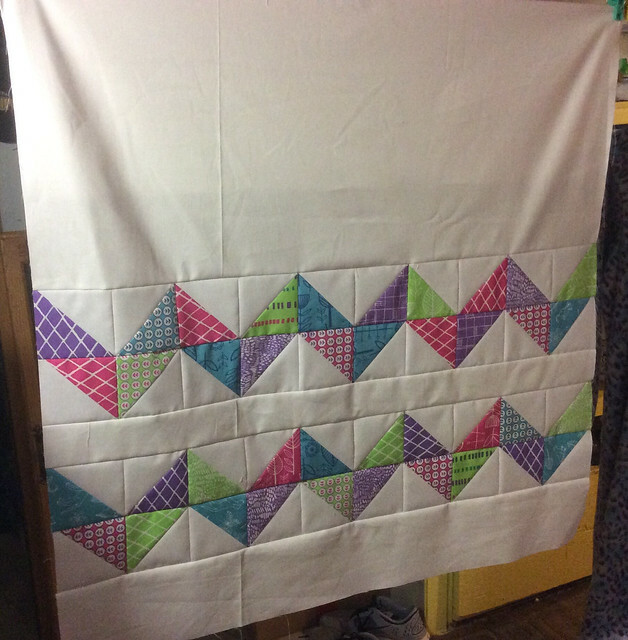 I spent Saturday having my own sew-in at the cottage and managed to finish quilting the whole thing. I am now in the process of sewing the binding. With any luck, I'll be able to finish this week and bring it to its recipient. I've said it before, I'm a maker of lists. Lists keep me focused, organised and they keep my brain from getting cluttered with stuff I need to do. So in the spirit of getting things done in 2015 (and maybe even winning some cool prizes! ), I decided to make a list of the stuff I want to get done this first quarter of 2015 and link up at Adrianne's for 2015 FAL. 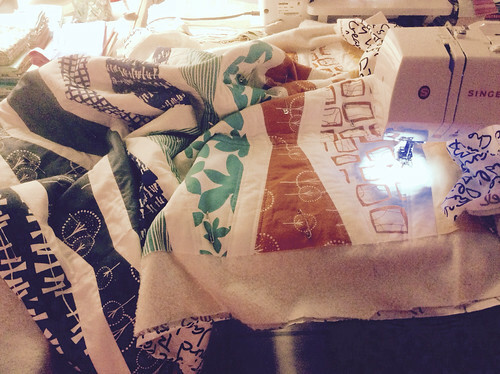 I need to finish the quilting, prepare and sew the binding and label the quilt. 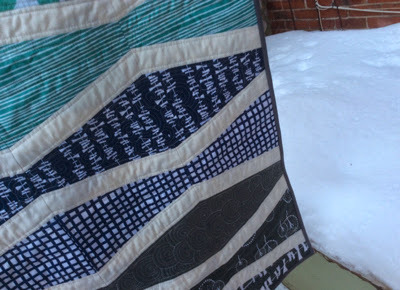 The recipient of this quilt is undergoing chemo therapy right now and could use the warmth and love so this is the first priority. 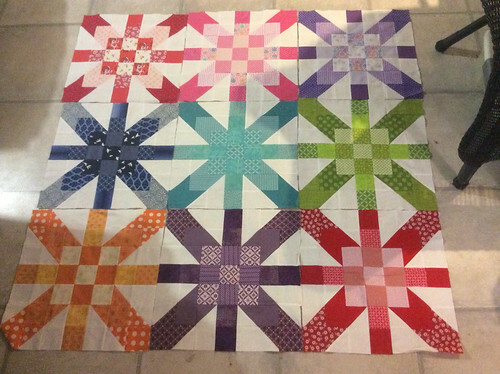 I must sew two more blocks (to bring the number to 12), sew the top together, quilt, etc. I would like to have this one finished for the guest bedroom at the Island so it needs to be done for the beginning of April. For this one, I need to purchase backing fabric, quilt it, bind it and get it ready for the MMQG exhibit planned for April or May. This is a blanket I started during the holidays. I really enjoy crocheting in the evening while the whole family is watching TV or a movie. 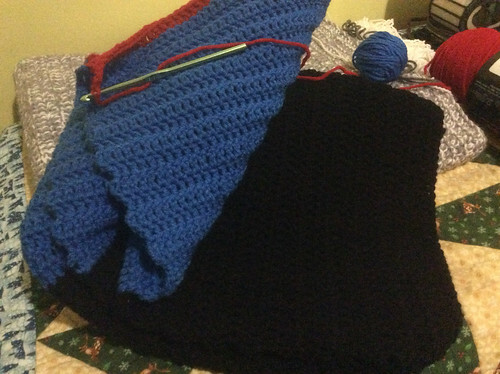 I am adding two blankets on my list because I get a serious case of ADD when it comes to crochet and I want to focus and get these done before moving onto other crochet projects.